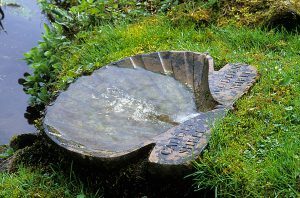 The catalogue of works at Little Sparta records that, between 1976 and 1995, Keith executed thirty-three works for the garden.ii In the sample reproduced here, we can enjoy the way that Keith’s exquisite craftsmanship animates Ian’s poetry – the spring, Caddis Shell, beside the Temple Pool (fig. 2); the tributes to cultural heroes such as Piranesi (fig. 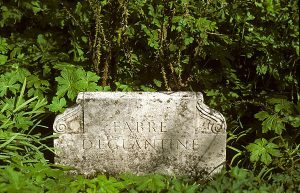 3) and Fabre d’Eglantine (fig. 4); the bench inspired by The Path of Language (fig. 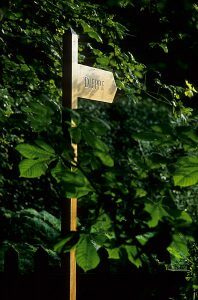 5); the signposts that enigmatically point the way to metaphorical destinations, Dieppe (fig. 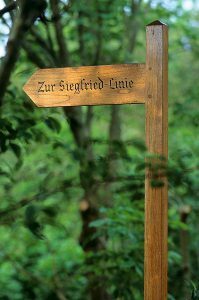 6) and Zur Siegfried Linie (fig. 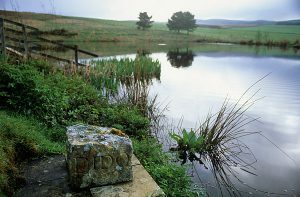 7); the solitary invocation, beside the lochan, of those forlorn lovers of antiquity, Aeneas et Dido (fig. 8). 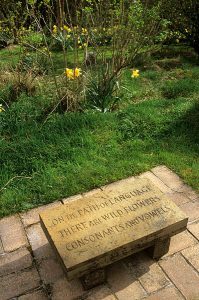 Through the chance, yet timely, intervention of Little Sparta trustee, Ann Uppington, Keith’s wild stone, Homage to Ian Hamilton Finlay, has been posthumously retrieved and, in September 2018, it was deposited at Little Sparta. Keith would have been thrilled. He would also be pleased that his fellow letter carver, Eric Marland, had been a catalyst and that his friend, Neil Warmsley, had driven from Cambridge to deliver the wild stone. Neil was welcomed at Little Sparta by trustee, Camilla Toulmin. 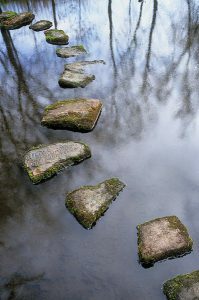 On reflection, Keith acknowledged that it was the first of these that proved to be his most challenging project for Ian. 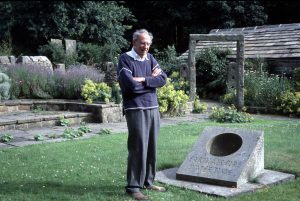 Ronnie Duncan had commissioned a sculpture to grace his garden at Weston in Wharfedale. The project became protracted by the excruciating technical problems encountered in the course of 1976, 1977 and early 1978, which tested Keith’s skill to the utmost. Nevertheless, the correspondence generated by this project contains two fine tributes to Keith, which highlight the quality of his craftsmanship. Ronnie’s patronage enabled Ian to realize his ideas about the rare type of sundial described by Vitruvius as an anteboreum.v So far, all his sundials functioned through the traditional means of a shadow cast by the projecting gnomon. The anteboreum, as the Latin indicates, is positioned ‘before’ or ‘facing’ north so that the hour lines receive light from the south. Inscribed within a concave hollow, the hour lines reveal time when illuminated by the shaft of sunlight shaped by the tiny aperture. Both aperture and sunlight can be seen in figures 11 and 12, and especially in Keith’s elegant maquette (fig. 11) that overlooks the anteboreum from a broad window-ledge upstairs. 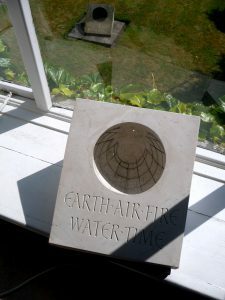 The typography of the inscription draws our attention to these elements – to Earth, embodied by the solid block of stone, and Air, which conveys the light of sun’s Fire over the rain’s Water, gathered in the concave pool below, to illuminate Time. However, it was with these words that Ronnie also identified the difficulties that Keith had so patiently resolved, but which nonetheless deterred Ian from attempting a further anteboreum. Over the years, Ian had only seen the anteboreum in photographs. Then, in 2003, the post-agoraphobic, seventy-eight-year-old announced that he would visit Weston (fig. 12). To my surprise, he first turned up in Leeds on the pretext that, after so many pots of tea shared in his kitchen at Little Sparta, he wanted to have a cuppa with me in my own kitchen. After a pot to wash down the scrambled eggs rustled up for the peckish traveller, we set off for Weston. Needless to say, Ian was delighted to see the anteboreum for the first time. He especially remembered the finesse with which Keith had calmly overcome the challenges in order to realise a sculpture that has since become unique in Ian’s oeuvre. i See Richard Kindersley, ‘Keith Bailey, Obituary’, Forum, Journal of The Letter Exchange (September 2017), pp. 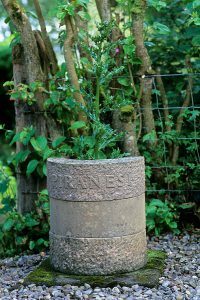 21-22.
ii See Jessie Sheeler, Little Sparta: A Guide to the Garden of Ian Hamilton Finlay (Edinburgh: Birlinn, 2015), with Robin Gillanders (photographs), Stephen Bann (foreword) and Patrick Eyres (introductions and catalogue), pp. 181-192. It is as well to note that the catalogue inadvertently awards Keith one too many works at Little Sparta. This is because the correspondence between Ian and Keith discusses work on the grotto during 1984. However, Ian superceded his original design with another in which the stone carving was executed by Nicholas Sloan. Unfortunately, when the catalogue was finalised, Nicholas was unable to confirm his contribution because his archive of correspondence had been flooded. iii See Patrick Eyres, ‘Garden, Park and Cityscape: A Checklist of Ian Hamilton Finlay’s Permanent Landscape Installations’, Ian Hamilton Finlay: Selected Landscapes, New Arcadian Journal 61/62 (2007), pp. 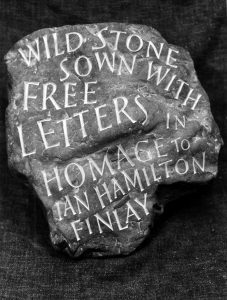 55-82.
iv Ian Hamilton Finlay, letter to Ronnie and Henriette Duncan, 20 January 1976 (Finlay Papers, Getty Research Institute). 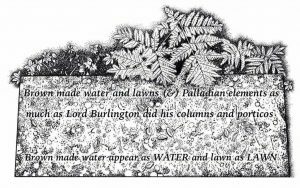 v For the evolution of the anteboreum sundial, 1975-1978, see Patrick Eyres, ‘The Weston Anteboreum’, in Eyres, ‘Collaborations, Proposals and Three English Gardens’, in Selected Landscapes, NAJ 61/62, pp. 86-96 (pp. 83-127). vi 16. Ronnie Duncan, letter to Ian Hamilton Finlay, 28 March 1978 (Finlay Papers, Getty RI).